This came up in my Facebook memories this morning and I couldn't help but share. Me and Topaz, circa 2015 at a schooling show. I was just talking to someone earlier this week about how selling her (and Tres) was one of the hardest things I ever did. Fortunately it was a perfect home at the perfect time, and I don't regret it at all, even though I still miss them. 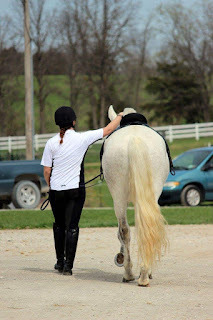 She is an incredibly special horse and I will always treasure the lessons she taught me and the time we had together. They're definitely a double-edged sword. The first six months after I sold her there were daily reminders and it was like a knife to the heart. But now with a little more time smoothing out the jagged hole she left in my heart, the memories make me smile! I also hear from her new owner and I know she's being treated like the princess she is, so it makes it easier.